A bad wine can trash great cooking like swearing at a wedding. But feasting at Paul Ainsworth’s No 6 in Padstow recently I was blind-sided by a stellar combination: scallops with sparkling Japanese sake. Fizzy rice beer paired with scallops? ‘The ruddy perverts,’ I hear you cry! But you too can ride Paul’s breaking waves of wonder, just grab your glass and read on. Shellfish in summer is my biggest treat – warm weather, cool booze and super-fresh food to give you the buzz of the ocean in every bite. Picpoul de Pinet is a brilliant all-round wine choice from the south of France, or of course there’s good old Sauvignon Blanc. But choose the glory of Gaillac for similar thrills that have somehow yet to break on our shores in earnest – I’ve found a stunner from Tesco for you this week. Off the beaten track, lock onto the refreshment of Austrian Grüner Veltliner or New Zealand Riesling for general seafood scrumptiousness, or indeed a classic rosé from Provence. But if you want precision, the tried and tested Chablis-oyster combo will do it, or fresh crab with Viognier. Italian whites from Fiano and Falanghina to Gavi and Grillo are thrilling with fritto misto – but for fish and chips, English fizz has the tentacles for the job! The crunch of the batter and the buzz of those bubbles really ought to feature somewhere in the National Anthem. 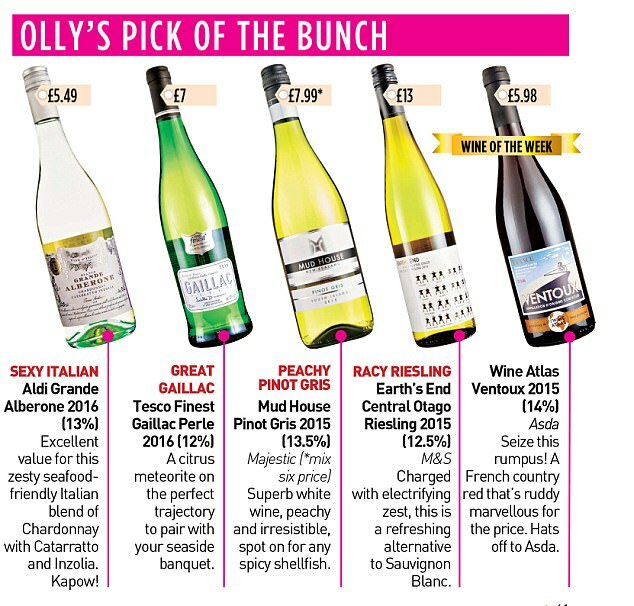 Spanish Albariño or Godello with squid is also a bullseye, but if it’s crispy chilli squid, get your Pinot Gris on – that richer fruit will lap up the spice a treat. And as for fish fingers? Bubbly that doesn’t break the bank – crémant, cava or Prosecco. But best of all, get yourself to Padstow and surf Paul’s scallops on a wave of naughty sake. You’ll find it leads to the shores of Happy Island.